Claypit Hill’s Spring has a lot of dead wood on the floor. This might look untidy, but it is home to lots of small creatures. Inside the logs and under the bark you might find woodlice, beetles, spiders and insect larvae. When a tree dies, the dead wood is a perfect place for fungi to grow. The wood is slowly eaten by mini-beasts, and rots back in to the soil, releasing its nutrients for other trees to use. Spaces created mean sunlight can reach the woodland floor. Wild flowers bloom, providing nectar for insects like butterflies and bees. Over many years, tree seedlings will grow up blocking out the light, and the whole cycle starts again. 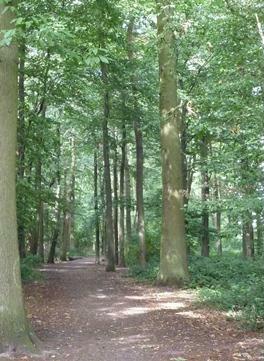 This Woodland Walk leads you around the Great Ashby Estate, taking in five woodlands managed by NHDC. Four of the woodlands have their own short route for you to explore. If you would like to be involved with the management and maintenance of this site you can find further information on the Countryside Management Service website.